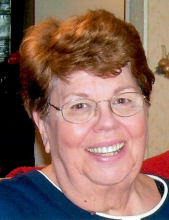 Donna Jean Ellis, 79, of West Frankfort, passed away Sunday April 14, 2019 at her residence at 7:37pm. Donna was born October 6, 1939 in Benton, IL to WC and Mildred (Naylor) McKinnon. She loved her grandchildren and great grandchildren. She was a member of the First Church of God on RT 37 for many years where she played the piano every Sunday and taught Sunday School. She loved her church family dearly. She also enjoyed scrapbooking. She married Fred Ellis on October 8, 1958 and he preceded her in death on August 20, 2004. She is also preceded in death by her parents and a brother Donald James McKinnon. Donna is survived by her sons Greg (Jonna) Ellis of West Frankfort, Bryan (Deena) Ellis of Oakhurst, CA; Grandsons Jarred (Amanda) Ellis and Jeremy (Megan) Ellis; 3 Great-grandchildren Eli, Aiden and Maddie. 2 sisters Mary McKinnon of Burlington, WI and Judy Webb of Ewing, IL. Funeral services will be Thursday April 18, 2019 at 11:00 am at the Union Funeral Home in West Frankfort with Pastor Gayle Stone officiating. Burial will be in the Denning Cemetery on the Orient Road. Visitation will be from 9-11:00 at the funeral home prior to the service. Memorials may be made to Hospice of Southern Illinois and will be accepted at the funeral home. "Email Address" would like to share the life celebration of Donna Ellis. Click on the "link" to go to share a favorite memory or leave a condolence message for the family.